Now 24 initial contacts with 4 SSB random contacts made. TK/DL1YMK was active from Corsica. For me it was reason to be active and try to work Michael. 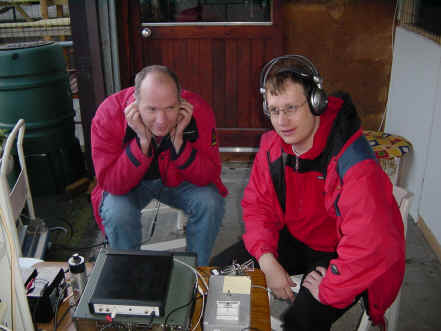 Michael copied my signal well but I ad lots problems in finding him, We succeeded the QSO being the first ever TK/PA on 3 cm. There was good activity and I made 6 QSO's and 4 initial contacts. After many years I decided it was time to be QRV on 10 GHz again. My station worked without problems with a solid echo and about 90 W in the feed. I made the first QSO with VK3NX being the first ever between VK and PA on 10 GHz and my first on the 10 GHz band. I missed several stations calling me because they were too weak or I just was not able to decode the CW because I don't know CW, I am sorry for that. During the ARRL microwave EME contest I was QRV with assistance from PA5DD. We had a limited window because off the high moon declination. 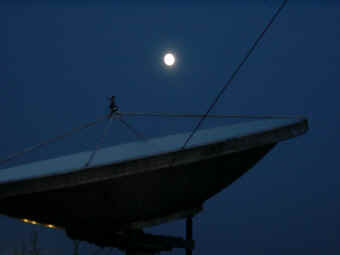 We where qrv from 04.50 until 05.30 UTC when moon elevation became too low. We made a total off 7 QSO's but we heard several other stations. We made one new initial OK1CA and we heard LX1DB who could have been a new initial as well. We also heard VE4MA and a very weak W7 station who was calling us. His signal was just a bit too weak to copy the full callsign. During the ARRL contest I had assistance from PA5DD to compensate for my lack of CW, and a visit from PE1JBK. PA5DD made the CW QSO's and we did some tests with the DSP-59+ from Timewave. This helped a lot to copy the very weak signals. We managed to make 7 QSO's but we heard some more stations. Copied where OK1KIR and DK7LJ in SSB. We called DK7LJ but got no reply. We heard several other very weak signals but where not able to get their callsign's. On 13 oktober I had a sked with W5LUA and with AA5C. I completed the QSO with W5LUA with "O" reports. I failed the QSO with AA5C because I did not hear him. After the sked with AA5C I called CQ and was called by several stations. I was not able to copy because two where in exact same frequency. Later I was called by a strong signal. I replied in SSB and I made my first random and first SSB QSO with WA7CJO. Reports exchanged where 54 both sides. Some time later another strong signal calling me. Again I replied in SSB and I made my second random SSB QSO with SM4DHN. Reports where 54 on both sides. 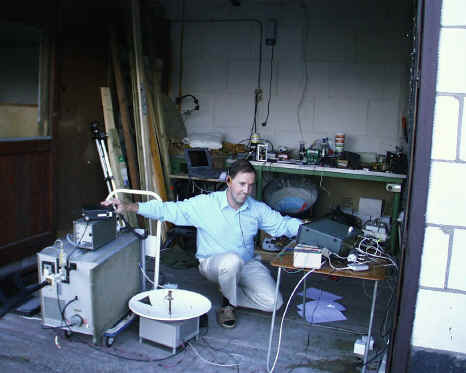 On 15 september 2001 I made my first 10 GHz EME QSO with W6DH at 14.00 UTC. We made a very quick QSO and all was ready within 15 minutes giving an M report to W6HD and receiving RST 549.
kHz high in frequency and no problem to find. that of the sun will vary from 13 to 16 dB. Thanks for a fine QSO in spite of the WX. The QSO was done with the station still in experimental setup. 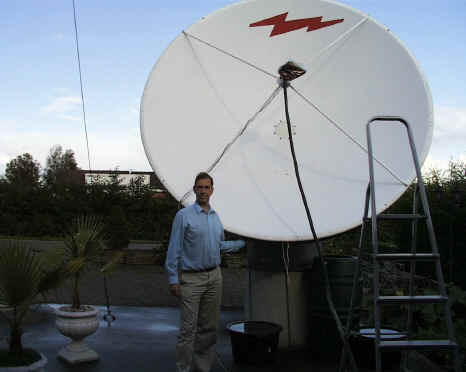 The TWT still must be installed at the dish and was now connected using 6 meter waveguide. 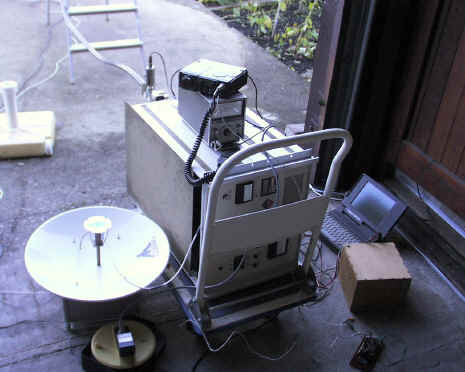 The antenna still must be steered manual and it take a lot of effort to get al things together. Most difficult is my lack of CW which gave me problems copying another station who was responding to my echo test's. Sorry but we will sure make a QSO in the near future. 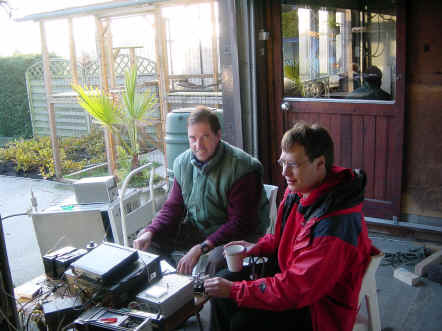 On 16 september I heard WA7CJO calling CQ with a very strong signal but due to the weather I could not transmit. After working on the elevation and azimuth antenna readout I tested the receive side using the sun and moon. By tracking the sun I found out that the azimuth readout was not OK when more then 90 degrees where tracked. Then I started calibrating the readout by turning it over 360 degrees. The readout showed 360 degrees but in fact the antenna moved about 20 degrees more. Then I put a reference line on the gearbox and rotated until the reference line was again in position. The counter could then be calibrated and I tried again to track the sun. Now the readout was working very well and over more than 180 degrees I find a difference of about 0.1 degrees. 12.5 dB from the sun and 0.9 dB from the moon. These values seemed OK so it was time to do the first echo test's. On 14-8-2001 around 09.30 UTC. I tried my first echo test which instantly succeeded. After that I tried some more tests. Listen to my first echo's of the moon using about 50 Watt output power. Now I must work on finalizing the station and getting the full TWT output. During the test my drive power was to little which gave me only about 50 Watt output from the TWT. Also I have to find a way to automatic tracking because tracking it by hand is not very pleasant. The readouts are well within 0.2 degrees accurate so the computer tracker must be no problem to realize. Most difficult problem is the mounting of the TWT close to the dish. This will probably be the most time consuming problem. Anyhow at this moment I can receive good echo's and when weather permits I can be QRV for EME QSO's.